JUDEX! He whose name means "Judge"! Created in 1917 by writer Arthur Bernède and filmmaker Louis Feuillade, Judex is the first of the dark knights, predating both The Shadow and Batman. 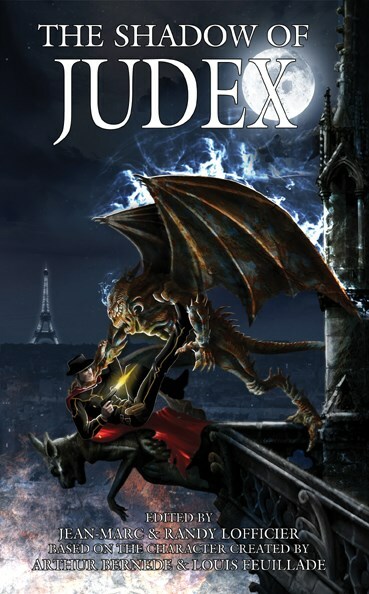 To avenge the death of his father, young Jacques de Trémeuse has put on the dark hat and cloak of Judex and embarks on a secret war to mercilessly punish criminals. This collection of 26 stories, 16 of which were written especially for this volume, by 15 of the best pulp writers from Australia, England, France and the United States, pay homage to this milestone of popular fiction. In it, Judex meets such icons as the Frankenstein Monster, Dracula and the Werewolf of Paris, crosses paths with France's premier super-hero the Nyctalope, survives the bloody trenches of World War I and the perils of Occupied Vichy France, remaining always faithful to his noble ideals, the very embodiment of Justice.